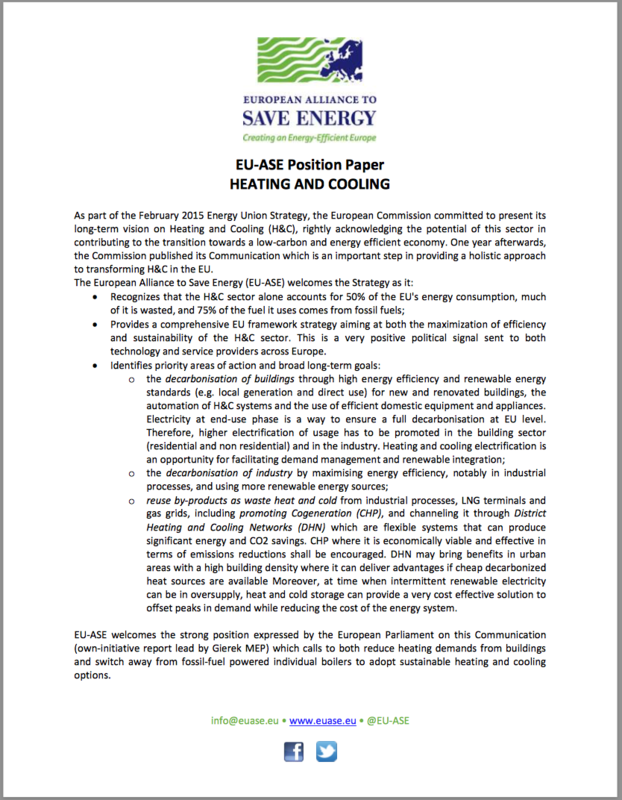 As part of the February 2015 Energy Union Strategy, the European Commission committed to present its long-term vision on Heating and Cooling (H&C), rightly acknowledging the potential of this sector in contributing to the transition towards a low-carbon and energy efficient economy. One year afterwards, the Commission published its Communication which is an important step in providing a holistic approach to transforming H&C in the EU. Considering the local character and potential of H&C, EU-ASE urges Member States to develop national/sub-national strategies supported by an integrated energy system perspective at EU and national levels. EU-ASE calls on regional and local authorities to facilitate the definition of a modern urban planning to integrate cost-effective energy efficiency solutions and on site generation to modernize the building stock and decarbonize energy supply. In this sense, EU-ASE welcomes the European Parliament’s plea for the adoption of specific sustainable H&C strategies to be developed at national level, as stated in Gierek MEP report.